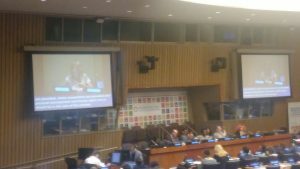 The High-Level Political Forum on Sustainable Development 2018 (HLPF), the United Nations mechanism reviewing the sustainable development goals took place from 9th to 18th of July in New York. This year, the theme of the Forum is “Transformation towards sustainable and resilient societies” and the focus will be on goals related to biodiversity, water, resilience and sustainability. ICAE participated in the Forum through the Education Academia Stakeholder Group, and has sent a delegation from the Secretariat. Member coalitions whose countries are presenting national voluntary reviews are also participating. Katarina Popovic, ICAE and Vernor Munoz, Global Campaign for Education (GCE), took part in the HLPF- Preparatory meeting on Sunday, 8th of July, organized by UN DESA OISC and the MGoS HLPF Coordination Mechanism, as orientation and strategy meeting geared towards supporting representatives of MGoS, individual NGO participants and Civil Society. The goal of the meeting was to help participants prepare and coordinate their engagement in the sessions and meetings of the HLPF. 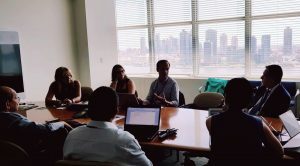 Every day of the official HLPF starts at 8 am with daily coordination and strategy meetings of the Coordination Mechanism of MGoS, where also the Members of ICAE and GCE represent the Education and Academia Stakeholder Group. 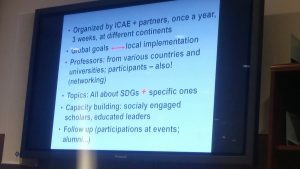 The EASG hosted a side event on “Education for Social, Economic and Sustainability” on 9th of July. The event gathered civil society activists, teachers, academics and government authorities and officials to discuss the trends, gaps and main features of education in the context of the Sustainable Development Agenda. It provided a comprehensive analysis of barriers and challenges of education for sustainable development. You can find more details about the event here. On 10th of July Education representatives met at lunch time for a Strategy and Coordination meeting, planning our next steps for this but also the years to come. 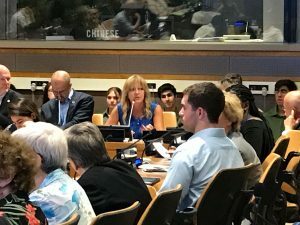 Also on that day, Katarina Popovic, ICAE​ Secretary General, concluded the ASPBAE – Adult Education and Lifelong Learning in the Asia South Pacific​ HLPF​ side event on “Learning cities: Transformation towards sustainable and resilient societies”. 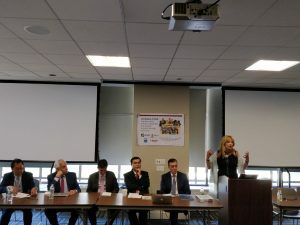 She formulated recommendations from the discussions of the event, emphasizing the pivotal role of education and learning in achieving SDG 11, SDG 12 and all the SDGs.Further information can be found here. Networking and Connecting is one of the major activities of ICAE at the High-Level Political Forum 2018. Among others, we have met Raul Valdes Cotera from the UNESCO Institute for Lifelong Learning about the importance of Learning Cities! 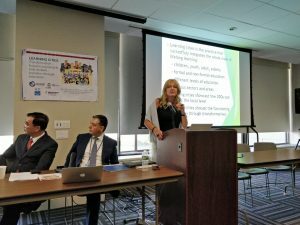 Katarina Popovic presented the ICAE Academy of Lifelong Learning Advocacy (IALLA) during the Learning workshop on “Student engagement towards realizing the 2030 Agenda for Sustainable Development” https://sustainabledevelopment.un.org/hlpf/2018/SDGsLearning. You can read more here. 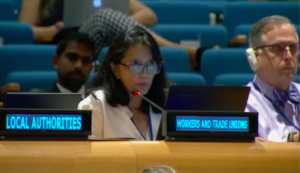 On Thursday we had two interventions and statements during the official HLPF meetings. 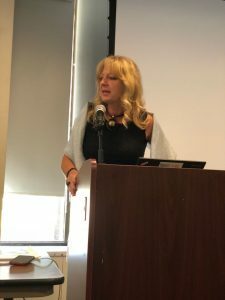 Katarina Popovic spoke about Learning Cities at the Thematic review session on “Perspectives of society” organized with Major Groups and other Stakeholders (MGoS). 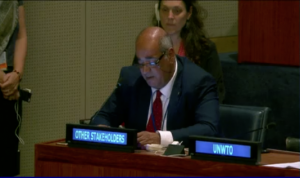 MGoS are crucial to the successful implementation, follow-up, and review of the 2030 Agenda. In preparation for the 2018 HLPF, MGoS contributed to review processes at all levels, including at the Regional Forums for Sustainable Development (RFSDs) and through national review mechanisms. Frank Geary from the The Bridge 47 Network and Irish Development Education Association – IDEA spoke about the importance of the integration of Global Citizenship Education and Education for Sustainable Development in the Global Goals for Sustainable Development during Review of the implementation of SDG 12 – Ensure sustainable consumption and production patterns. 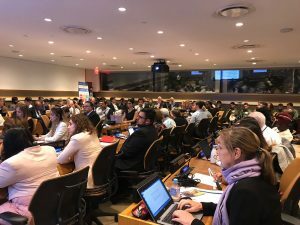 The second week of the HLPF was dedicated to the ministerial meetings and the Voluntary National Reviews by the member states on their implementation of the Sustainable Development Goals. Our colleague Maria Elena Urbano Dorado from Global Campaign for Education responded to the Uruguayan Voluntary National Review on behalf of the Major Groups and other Stakeholders, while Refaat Sabbah reacted to the reporting of the Voluntary National Review the State of Palestine. On Wednesday, the 18th of July, the Ministerial Declaration and the draft report of the HLPF was adopted by the member states. On this website and social media, we will keep you informed about the HLPF development and the contribution of education civil society to the event. For more information, please contact Ricarda at policy@icae.global. 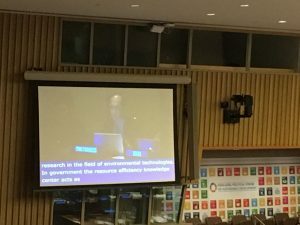 This entry was posted in News and tagged HLPF by Ricarda. Bookmark the permalink.